Part 1 Information and technology in the world: Information as a resource; Valuing information; The shaping of information and technology. Part 2 The impact of information technology: A brief history of ICT; Literacy and counter knowledge; Computer and information literacy. Part 3 Critical theory: Critical social science; The colonisation of the life world; How organisations affect the way we think. 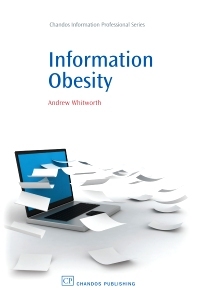 Part 4 Combating information obesity: Information obesity and romantic understanding; From problem-based learning to transformative learning; Connecting learners and teachers to the community; Three examples. An exploration of information literacy and ICT skills education from the point of view of social and political theory. The author incorporates theories to argue why the idea of information literacy is so important in the 21st century, and also to develop teaching strategies to this end. The book argues that only through expanding the range of information literacy education taking it beyond just formal school and university education and into homes, friendship networks and workplaces can we construct an effective educational response to information technology in the 21st century. Information literacy includes, but transcends, ICT skills and ultimately is about being politically, socially and communicatively competent in an information society. Andrew Whitworth is Senior Lecturer in the School of Education at the University of Manchester and Programme Director of the MA: Digital Technologies, Communication and Education. He has written many chapters and articles on DMIL, and was the author of Information Obesity with Chandos Publishing. He has presented the ideas surrounding A critical theory of information literacy in keynotes at various conferences including Creating Knowledge VI, Information literacy: A way of life? and the IFLA/UNESCO conference in Moscow which led to the Moscow Declaration on Media and Information Literacy. His Media and Information Literacy course at Manchester was named as an exemplar of the field by the Learning Literacies in a Digital Age project and he was also the only European winner of a Blackboard Catalyst award for his work with distance learners.